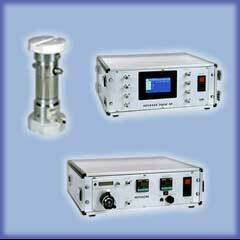 HOVACAL is a calibration gas generator especially designed for calibration of continuous emission monitoring systems. HOVACAL generates a defined mixture of air and water vapor and is also able to generate different other gas vapor mixtures like mercury chloride, hydrogen chloride, ammonia, hydrogen fluoride and others with defined concentration. The desired component is available as a standard solution in different concentrations. HOVACAL consists of an easy portable supply unit and an evaporator unit. 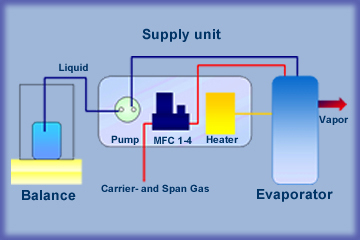 Supply and evaporator unit are connected via tubes for liquid and gas and electrical cable for power supply and RTD signal. For generating a defined water vapor concentration, gas flow will be adjusted with the build in mass flow controller and the liquid flow will be achieved with a peristaltic pump. To obtain accurate concentrations, it is necessary to determine the liquid flow with means of a analytical balance.